Yuktix is an IOT startup developing smart sensing and ICT solutions for Agriculture and Environmental Monitoring. Here we are releasing our python library for accessing Yuktix public API. This release is limited to weather network and public API only. You can access the public API doc from here http://www.yuktix.com/m/aws/media/yuktix-public-api.pdf . Yuktix public API are REST API and of course you can write a client in your favourite language. All you need is your public API access key that you can see on your account | profile page. This is a wrapper built using Request library (http://docs.python-requests.org/en/master/) and tested with Python 2.7.11. The full code is available as Gist right now. I will do better packaging and check it in a Github repo as well. I know all about API abuse. we are a small team and the only time I get to work on such stuff is between 12:00-3 AM so please play nice! 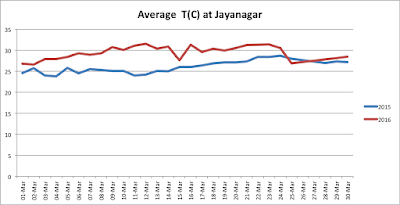 Temperature data from 7 stations across Bangalore shows the maximum temperature rising towards 40C. see the difference between 1st week of April and the third week. Here is the Max temperature sand worm digging up towards the surface! 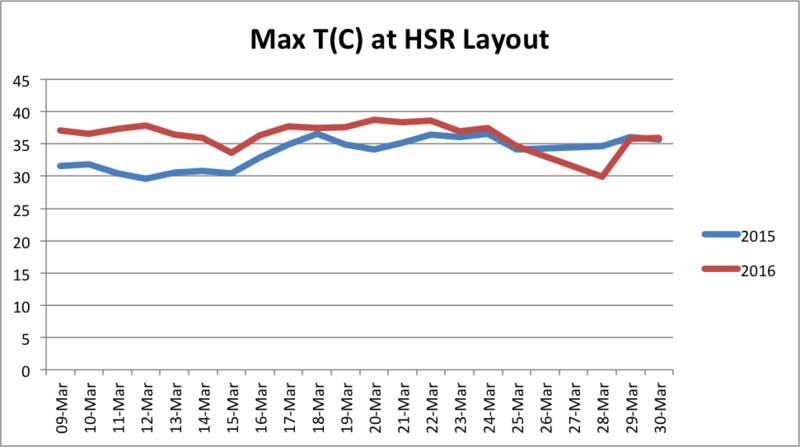 The big dip is due to Thejesh station at EC going offline on 5th and not recording day time temperatures because of UPS failure! switch to Solar, I say! One question you always ask is, am I recording what I am recording? Big effects should show across all the stations and looks like something happened on 6th. All stations are in tandem! 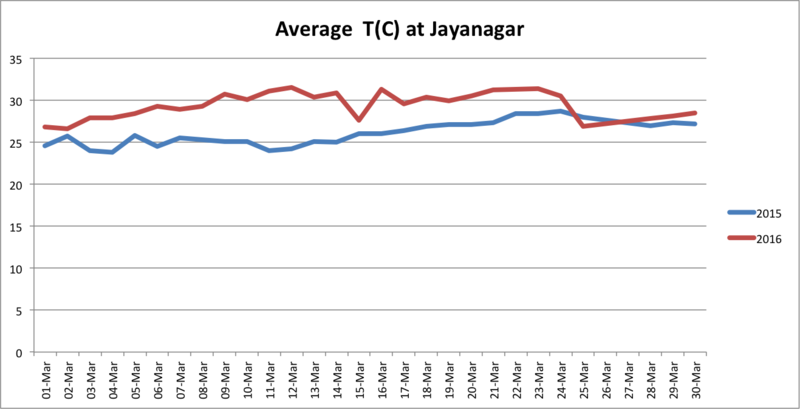 We record temperature data across the city and here we show graphs from two stations, one inHSR Layout and another in Jayanagar 4th Block. 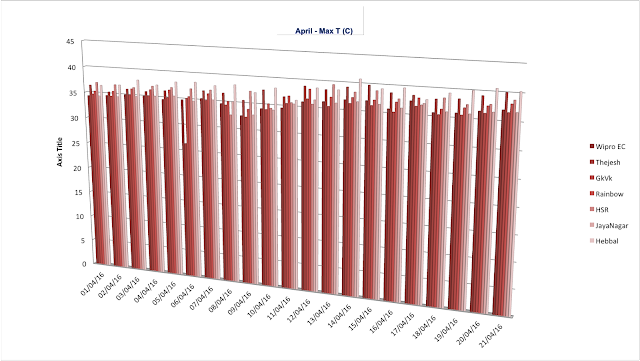 Raw data from more stations is attached for intrepid folks. 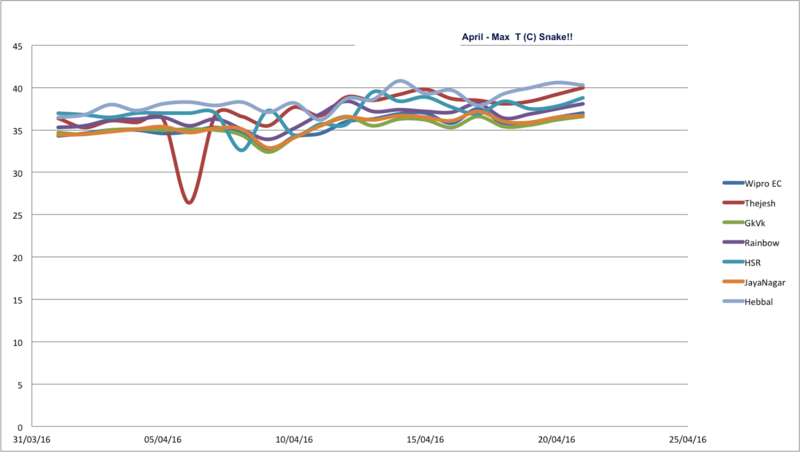 We show the trend for minimum, maximum and average temperature plotted across days in march 2015 vs. march 2016. 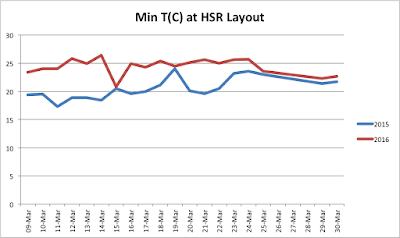 Both the minimum temperature as well as Maximum has gone up so no cheating averages here. The days were actually hotter on the whole! Maybe I will plot raw data across too instead of aggregates just to get the kicks. 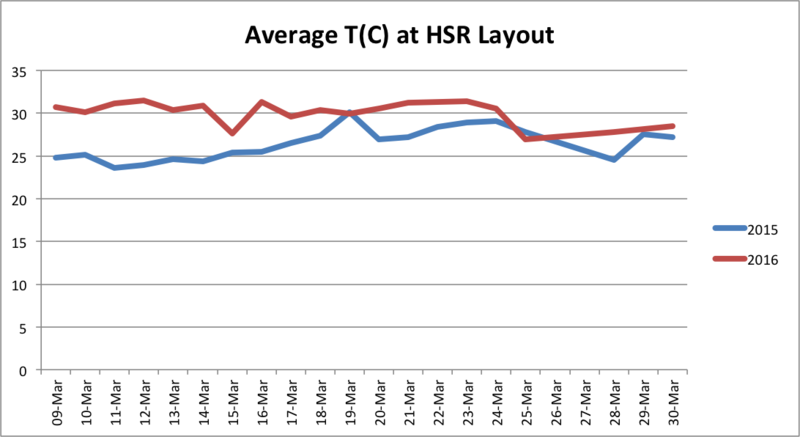 Interesting data is that first half of march was lot hotter compared to second half. 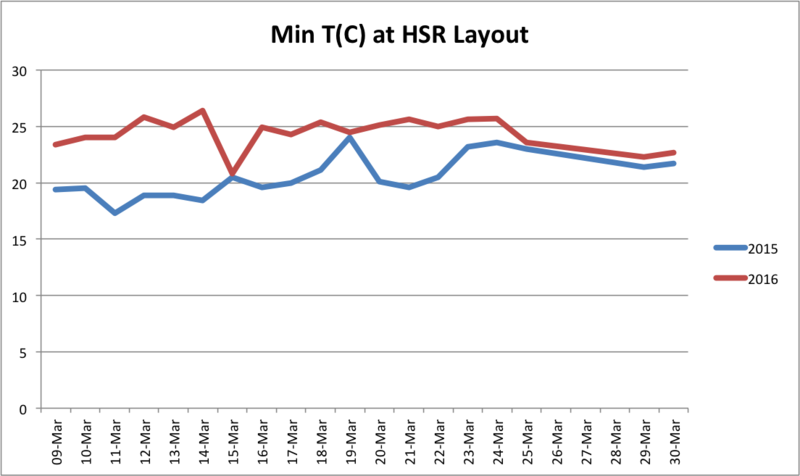 Last 5 days the temperatures actually come closer together. The spread in average is a good deal of 3-4 degrees centigrade. Look at the max and min. here too! 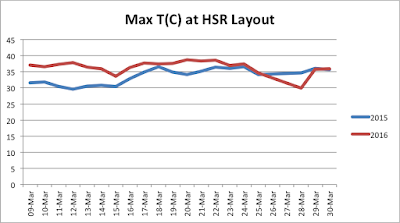 The spread is 5-6 degrees more than the last year! 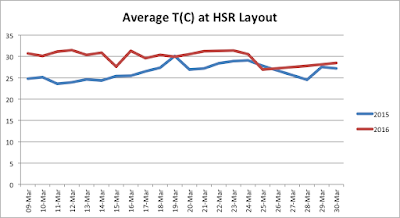 Should we say that HSR in first half of march in 2016 was 5 degrees hotter than 2015? Working in a start-up and like Yuktix which is into IOT (Internet of Things) for Environmental monitoring and Agriculture means a lot of field trips across the city to the remote places in Bangalore. Also now days, every job is stress full and not because of the work pressure but because of many other factors like traffic, pollution(air, sound). And when you cross some of the most busiest junction of the city like silk board and some one just behind you honk with out any reason, just like he is on a F1 race track, you feel getting out of your car or scooter and say ******* ? Wait !!!! what is it, feeling too much annoyed on some one honking behind you is a symptom of you being in stress and tension. Bangalore is IT capital of the nation and the top most city giving birth to new start-ups and rise to number of job opportunities in the cities and thus leads to migration of people from different part of country to Bangalore. 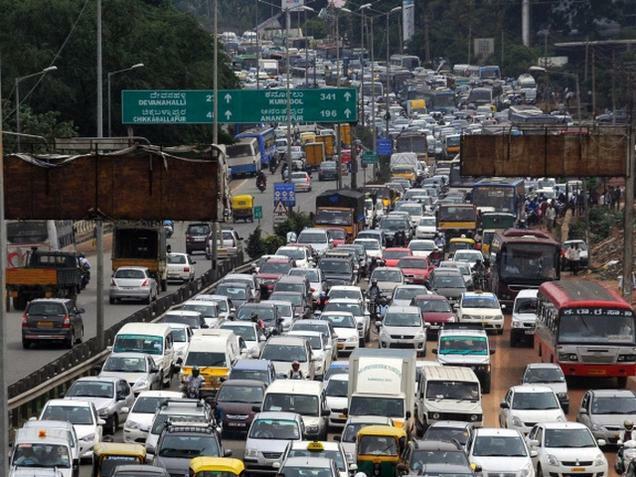 As per daily newspaper The Hindu, there are 55 lakhs vehicles plying on the roads of Bangalore with a average speed of 15km/hour which as per observation is going to decrease further to 9-10km/hour. With these much vehicles on the road and even 10% of them or 1% of them honking, one can assume amount of noise pollution, but we can never say as we don't have any real time data. Although Government of Karnataka via KSPCPB(Karnataka state pollution control board) has installed 5 continuous monitoring station at BTM layout, Marathalli, Nisarga Bhavan, Parisara Bhavan and Pinia. Below is the snapshot of the noise pollution for the year 2013-14. By the year 2014-15, 5 more station have been installed in Bangalore in sensitive areas's and they are NIMHANS, RVCE Mysore road, TERI office - Domlur, White filed industrial area, Yeswantpura Police station. 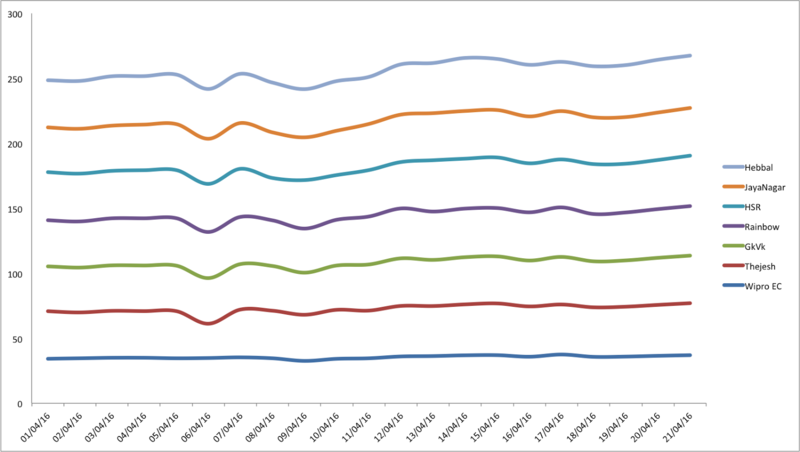 Here is the data collected from these sensor's. link As per CPCB, in industrial areas, the maximum allowed limit is 75dB in the day and about 70dB at night. Similarly, in residential areas the (permitted) limit is about 65dB in the day and 60dB at night, and in areas which qualify as silent zones, like areas surrounding hospitals, the prescribed upper limit is about 55dB in the day and 45dB at night. Frankly, the biggest and the strongest effect of noise pollution, i see is stress, aggression and hypertension. Even sometime, ,i feel the effect of the same. In this busy life of IT and digitization, when everyone is too much busy, there is always a stress factors added to it. With noise pollution it always increase. Below are some of the adverse effects of noise pollution. Noise levels above 55dB are sufficient to cause annoyance and aggressive behavior. Also sound level above 75 dB can lead to increased stress levels, increased heart rates and potential hearing loss. Here is link to small article on the ill effect of noise pollution on the health of Traffic cops in Bangalore. Most of the cops suffer from tinnitus. Also as per this article, Bangalore stand at second place with 1906 suicide cases in 2014 and hypertension, stress might be the reason for the same. So what is the need of talking all about it here. Point to be taken from here is, Noise pollution is one of the stress inducing factor in daily life of people living in metro cities who already have lot of stress in their life. Suppose you are moving through some of the busiest junction in the city, being inside the car, you don't care if anyone or even you are honking or not. Or even a administrative officer in Karnataka government get real time update on his mobile if any of the units find more than allowed, then atleast traffic cops can take some preventive measures. And the biggest things is awareness among the people. Data which is not public is of no use. These days with social media, its lot easier to distribute data and make people aware. Once people are aware of the levels of noise and its ill effetcs, they themselves will stop honking. Yuktix has developed in-house highly sensitive ambient noise sensor capable of measuring noise from 0-120 dB SPL RMS DC values. 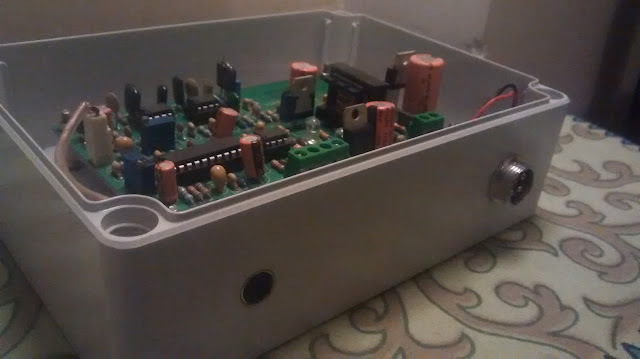 These sensor when plugged with Yuktix IoT (Internet of thing) platform will turn into real time noise pollution monitoring station capable of running on both solar power and AC power. Data from these units would be published on the Yuktix Cloud which would be open to public as well as on Android application. We are trying to partner with some NGO's and companies working towards social cause in installing these real time ambient noise monitoring stations at some of the busiest junction across the city. Very soon we will be publishing a article with more data about our Ambient noise sensor, its sensitivity and comparison with other available DIY sensor. @Yuktix. Awesome Inc. theme. Powered by Blogger.